Adrien Thomasz. Key was a Flemish painter who trained in the studio of Willem Key, whose name he seems to have adopted. He produced a large body of work for churches in Antwerp, as well as woodcuts, although his best works are portraits. These can be divided into two phases: early, more realistic images and later portraits that reveal the clear influence of Antonis Mor, with their more pronounced interest in conveying the sitters’ social status. The present panel depicts William I, Prince of Orange and leader of the revolt of the Low Countries against Philip II of Spain. Two other versions are known, one in the Rijksmuseum in Amsterdam and the other in the Mauritshuis in The Hague. The present version is the only dated one. The dark background helps to emphasise the flesh tones and the sitter’s white ruff, which in turn emphasises the realism of the features. Adriaen Thomasz. Key is first documented in Antwerp in 1568 where he is recorded in the painters’ guild. Little information survives prior to that date, although his early works, particularly his portraits, bear some resemblance to those of Willem Key. Adriaen Thomasz. Key was a history painter and designer of prints, but was primarily noted for his portraits in which his sitters are carefully rendered with a plain, sober presentation. Key is documented in Antwerp until 1589 at which point his name disappears from the city’s records. This panel of William I, Prince of Orange, is known in two further versions. All three are considered to derive from a now lost original. Of notably high quality, all three are considered autograph and differ in various small details. The other two are in the Rijksmuseum, Amsterdam, and The Mauritshuis in The Hague. Of the three, the present panel and the Amsterdam version are the closest to each other. Key presents the sitter against a dark background in which the flesh tones stand out strongly, as do the white ruff and the elegant grey and gold trimming on the front of the coat and shoulder. 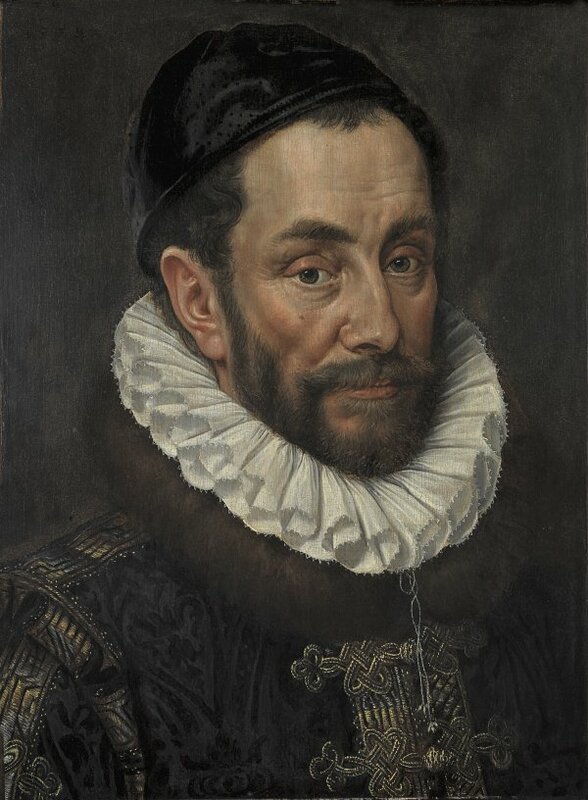 The face is crisply defined with a wealth of details that individualise it such as the wrinkles around the eyes, the heavy rings underneath them, the flaccid cheeks and wrinkles on the forehead, all depicted in conformity with the realist approach typical of Dutch portraiture at this period. The Prince is depicted at the age of 46 according to the date at the upper left corner of the panel. In the version in The Hague the figure is reduced on the left side and lacks the shoulder and arm, while his expression is more severe. The fact that this portrait is known in other versions, all of high quality, may be due to the political significance of the image. William I, Prince of Orange (Dillenburg, 1533–Delft, 1584) led the rebellion of the Low Countries against the Spanish rule of Philip II. The period in which this panel was executed was one of maximum tension, following the sack of Antwerp by the Spanish forces in 1576. William made use of this situation to create a common front among the Provinces to defend his religious beliefs and institutions. He was assassinated in 1584. The panel has been in the Collection since 1928, having been acquired from the Amsterdam art dealer Jacques Goudstikker who had owned it since 1922.